Do you love to travel? Now Imagine winning a one-year-travel-all-you-can pass plus pocket money!!! Wouldn’t that be amazing? That dream just became a reality for three graduating college students from Davao. Geia, Dominic and Chin took home the grand prize of one-year travel-all-you-can passes to Cebu Pacific’s local and international short-haul destinations plus pocket money from co-presenters GetGo and Union Bank. 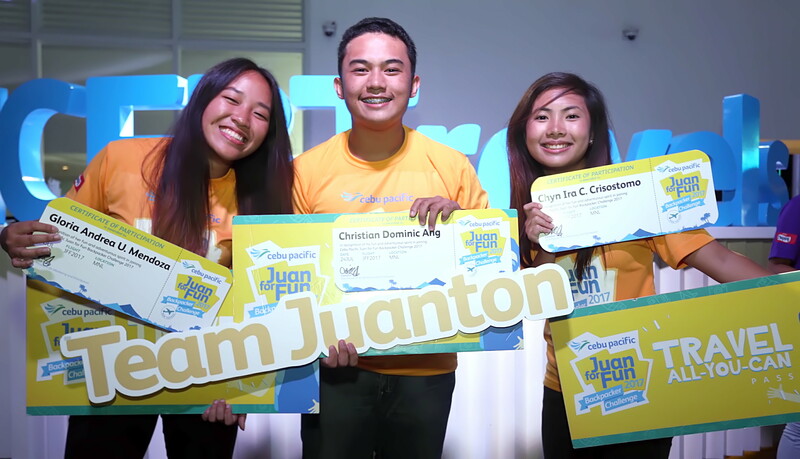 The three students—18-year-old Gloria Andrea Mendoza; and 19-year-olds Christian Dominic Ang and Chyn Ira Crisostomo, comprised Team Juanton for the Juan For Fun (JFF) ​​2017 Backpacking Challenge of Cebu Pacific, now on its 6th year. This contest makes participants think creatively when designing a fun itinerary for surprise destinations, work efficiently to maximize a limited budget, and carry out challenges within a seven-day period. The Juan For Fun Backpacking Challenge brought five teams of students for an epic, seven-day fun race across the country, with P40,000 in pocket money, Boreas backpacks, and Oppo camera phones. Davao’s Team Juanton beat four other teams—Team Phun of Bacolod City; Team Malackai of Baguio City; Team Patsada of Cagayan de Oro and Team Barbie from Metro Manila, with an adventure travel itinerary that covered Dumaguete and Siquijor—destinations never before visited by JFF contestants. They ventured to the waters with island-hopping and scuba diving before proceeding to Cebu and then to Legazpi. “The Philippines is a beautiful country and many Filipinos have not had the opportunity to explore their own country. Juan For Fun is our way of advocating travel within our own country—especially for young Filipinos. There is much to see and do in the country and this one of the reasons why we continue to expand and offer flights to destinations in the Philippines. We want to make air travel easy, affordable and accessible for everyJuan,” said Charo Logarta-Lagamon, Cebu Pacific Air corporate communications director. Would you like to join the challenge next year? Update yourselves by visiting www.facebook.com/cebupacificjff and by following Cebu Pacific’s official Facebook and Twitter (@CebuPacificAir) pages.